Map Kibera Trust has been a bee-hive of activities lately! Despite the social context changing drastically due to a general security decline in Nairobi – the fear of bombs and terrorist attacks — as well as the fast buildup of election activities in Kibera, Mathare and Mukuru, our teams have done a lot to reach out to the community and meet our various objectives using our digital platforms. In Kibera, we have among other things succeeded in conducting a re-mapping of Kibera, activated existing community networks through the community forums that we have organized, and enhanced dialogue with community leaders and representatives leading to better ideas and even new suggestions to strengthen our work. In November, we made the first major print-out of the edited maps and engaged in an elaborate map-distribution drive (see our detailed blog post) that saw us distribute 109 maps to 83 different institutions so far. We are already receiving great feedback that will help our planning for the next steps. KNN have continued making videos and posting them on their youtube channel. Voice of Kibera has intensified their community outreach to publicize the SMS line in order to improve submissions. All three programmes have spent much time in Mukuru and Mathare helping pass skills to the teams in these locations and conducting in-house refresher trainings to prepare the teams for an elections related project sponsored by the United States Institute of Peace. All teams are now ready to engage in any kind of work. A modality of equipment sharing was devised in order for the other groups to get access to complete their work. Other than that, the USIP project implementation is on course and on schedule for Kibera, followed immediately by Mathare and Mukuru. The teams have completed elections boundary mapping in all the 3 locations and are currently engaged in the electoral points of interest mapping. We have successfully set up project coordination points and project offices in Mathare and Mukuru which has improved coordination and is likely to enhance efficiency in the coordination of the projects. Several in-house trainings have been conducted in all the 3 locations, Kibera especially benefitted from local partner organizations’ training curricular on subjects like journalism ethics and photography from Pawa254, a local organization and conducted sessions led by volunteer interns like Job Mwaura, who recently did a post-graduate academic study on Kibera News Network to be presented as a case study on Citizen Journalism. We have since agreed to expand these training opportunities to reach other teams in Mukuru and Mathare. The organization as well participated in 3 major conferences and presented in 2 of them. Two Map Kibera Trust members attended and presented at the 7th ESRI user conference that was organized by ESRI Eastern Africa and which took place in Naivasha in early October. Later in the same month Kibera’s Director attended the ON –Omidyar Network Baraza conference in Accra, Ghana. 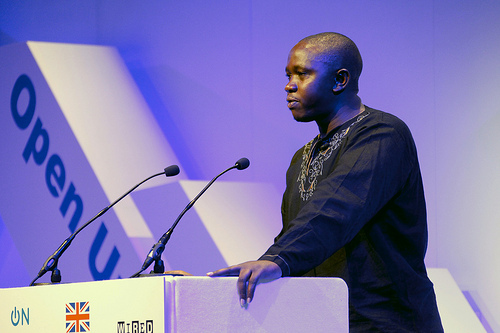 Kepha Ngito speaking at the OpenUp12 conference in London, November 2012. In early November, Map Kibera Trust was presented on a speakers’ panel at the Open Up 2012 conference in London organized by the Department of International Development, the WIRED magazine and Omidyar Network. These conferences brought together ICT experts and leaders from different parts of the world thus provided Map Kibera Trust a global opportunity for networking. It’s worth mentioning that the intense activity in the period has exposed gaps that have threatened our work and hampered progress in a few ways. For instance, bureaucracy in accessing government structures and institutions for permission has been the main challenge forcing us to postpone activities that require specific legal permits. This item has taken more time to deliver on as anticipated mainly because we have spent and are still spending much time and effort scaling the bureaucracy to reach the relevant decision makers. We have however widened our networks through the various meetings and forums we have been conducting and even brought some of the decision makers on board. Again, with the changing dynamics of our socio-political context, we have realized the need to enhance our capacity to track changes, document and report them in good time. Finally, we have seen the increasing need to enhance our community engagement strategy to facilitate the usage of the data and information that we distribute to the community by the community members. For example the perennial question of “what do we do with the maps?” still persist in the community and Map Kibera still needs to do much either in modeling strategy and obtaining resources to sustain the work already happening in the community. You are currently browsing entries tagged with USIP at Map Kibera.